Bring a large pot of salted water to a boil for the noodles. Trim, deseed and thinly slice the green bell pepper. Thinly slice the snap peas. Thinly slice the Swiss chard stems and chop the leaves. Trim and chop the scallions into 1 inch pieces. Once the water is boiling, add the rice noodles. Turn off the heat. Stir the noodles occasionally until they are tender, about 8 to 10 minutes. Drain and run under cool water to stop the cooking process. Place the large nonstick skillet over medium-high heat with 1 tbsp vegetable oil. Once hot, add the sliced green pepper, snap peas, Swiss chard stems, scallions, and a pinch of salt and pepper. Cook, stirring frequently, until the vegetables are crisp-tender, about 3 to 4 minutes. Add the cooked rice noodles, Swiss chard leaves, green peas, tamarind pad Thai sauce, as much of the chile garlic sauce as you’d like to the skillet with the vegetables. Toss well, and cook until the sauce is mostly absorbed, about 2 to 3 minutes. Halve the lime and add the juice from half to the noodles, off of the heat. Cut the remaining lime into wedges. 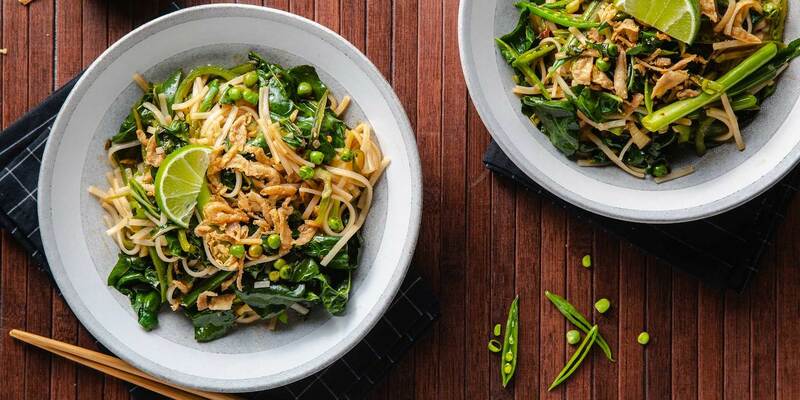 Serve the spring pad Thai on large plates topped with crispy onions and lime wedges.